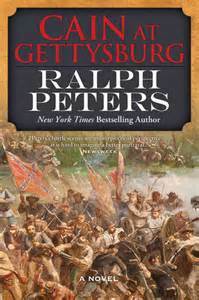 Cain at Gettysburg by Ralph Peters. Forge Books. 549 pages. I’ll have to give Ralph Peters credit for writing a book on a subject that has been thoroughly explored, as well as flying in the face of one of the best written books having to do with the Civil War. In the author’s notes at the end, Peters even credits The Killer Angels as being the best book written not only about Gettysburg, but about the Civil War. But Cain at Gettysburg is no slouch. Peters is thorough–which can be good or bad–and spends several hundred pages setting the battle up. I have read his other Civil War book, Hell or Richmond, and found them both very detailed, rich with speculation on what generals were thinking at any given time, highly descriptive of the lives of the common soldier and rich with the details and gore of battle itself. This is no Red Badge of Courage. There is not glory to be had, and when you realize the devastation and terror each soldier went through in battle, it’s amazing that war continues to happen. I also want to give Peters credit for taking a fresh approach toward what parts of the battle are depicted. The battle for Devil’s Den and Little Round Top–actually my favorite part, and the part so aptly presented in Killer Angels–is thoroughly ignored, as if it never happened. Indeed, Gettysburg is so large that there are probably many instances that aren’t included. That’s probably a good idea, because it gives the reader a fresh view of the larger picture. So what’s not to like? Well, I found the book slow at time, especially when they the author lingered in internal dialogue of generals’ self doubt or bickering between privates (I experienced the same thing in Hell or Richmond, although I enjoyed the other book better). I found myself skipping through several of these sections. I thought some of this could have been tightened up. Peters strikes me more as a historian than a novelist, and although the book is rich with detail, it should be probably be approached from that perspective. I give Cain at Gettysburg three and a half stars.